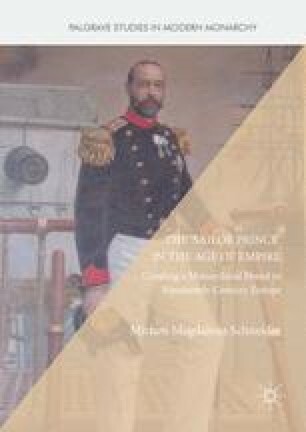 This chapter introduces the figure of the ‘Sailor Prince’ as a popular monarchical brand of the nineteenth century which arguably helped Europe’s monarchies to hold their ground in the contested political mass market. It outlines how the usually overlooked younger sons of Europe’s royal houses, through their choice of a professional naval career, linked the monarchy with one of the quintessential ‘cultural presences’ or ‘lieux d’histoire’ of the Age of Empire: the sea. The chapter defines how the ‘Sailor Princes’ of this study fundamentally distinguished themselves from earlier royal admirals. And it inserts the ‘navalization’ of monarchy achieved through the intimate link with the naval forces into the larger context of the remarkable survival of monarchy in the long nineteenth century.